This image is a bit of a one off. The function used to generate it is given by \(f(z) = z^4+z^2+z_c\). At the time I generated the image, I was playing around with various polynomial forms in an effort to see something interesting. I found this image to be kind of cool, but generalizing the code to handle more arbitrary polynomials was not a task I felt up to at the time. 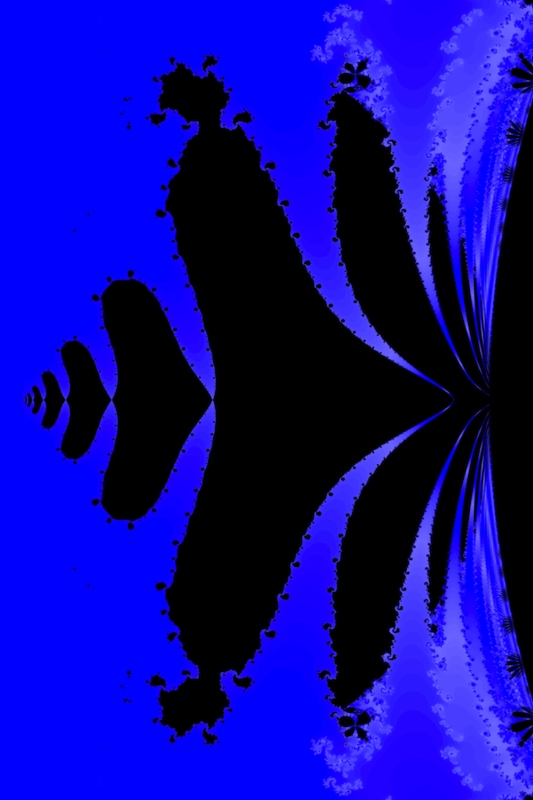 In short, the code used to generate this image is not part of the Mandelbrot image generating program that I have published here. That being said, I find this picture fascinating for a number of reasons. First off, one of the nice properties of analytic functions is that you generally don’t have to worry about the behaviour of terms of degree less than the highest degree term. That is, if you are interested in the limit behaviour of a polynomial like \(x^4+x^2+c\), the \(x^4\) term grows so much faster than the other terms that you can often safely ignore them. Because of the iterative nature of the process which generated this image, however, the higher degree term does not completely wash out the other terms. This is not unexpected, but it is nifty, none the less. There is also a structure in the image that I think is worth looking at. If you have a gander at the full-sized image (about 11.7 MB, click the picture above), and look at the region near the center of the right side, you will see some very fine spindles of color intruding into the blackness of the set itself. These very fine structures bear a resemblance to the seahorse and scepter valleys in the Mandelbrot set, but are incredibly fine and fragile-looking. I have never previously seen anything like them.